The president meets with the nation’s 2.5 million displaced schizophrenic voices. 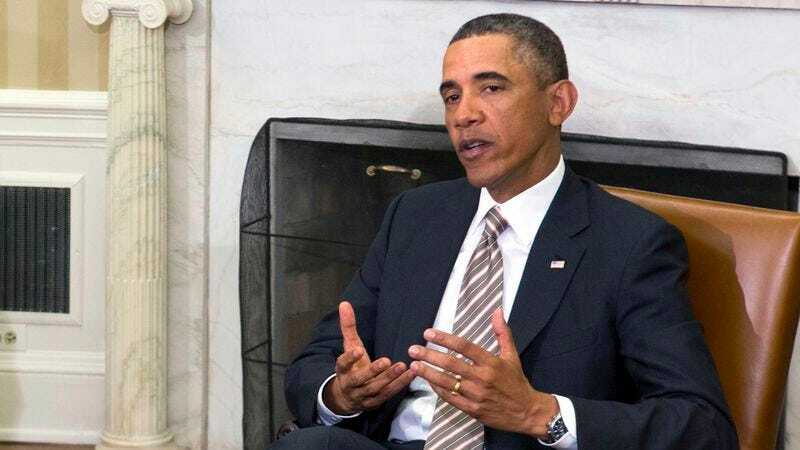 WASHINGTON—With the nation still reeling from Monday’s mass shooting inside the Washington Navy Yard, President Barack Obama held a bilateral meeting with the country’s schizophrenic voices earlier today, urging the disembodied auditory hallucinations to join him in helping to reduce violence. The special summit, which was open to reporters, began at 9 a.m. in the White House’s East Room, where the president and over 2.5 million schizophrenic voices of various degrees of intensity from all across America engaged in an open dialogue covering issues as varied as violence in America, mental health care, the incessant wriggling of worms, gun control, the tearing of the flesh, and the passage of meaningful legislation. In the hours since the meeting, political experts have called the White House’s efforts to reach an agreement with the schizophrenic voices “an unequivocal failure,” with many suggesting the president never managed to adequately appease the concerns of the irrational and angry voices and may have even driven them closer to the brink of violence. At press time, a representative for the nation’s displaced schizophrenic voices told reporters that the time for action is now, something must be done, and there can be no more delaying.